Brothers Lee and J. Kent Rudeen, missionary kids raised in Central and South America, share a passion for using media to tell God's Story, especially when they get to use clay! 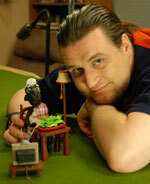 Lee, having grown up on a steady diet of sock puppet shows and flannel-graphs (remember those? ), has a special love for Kingdom storytelling. 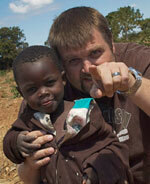 He currently serves in Lenexa, Kansas as a video producer at the Global Ministry Center for the Church of the Nazarene. Kent was born in the country of Panama and his childhood involved hiking through jungles and climbing trees like a monkey. His earliest creative juices were fueled by bananas dipped in Tang. An art major, Kent currently works in graphic & web design in Lacey, Washington.